Hydra offers to its quests the opportunity, inside from a variety of local customs and activities, to entertain themselves and get in touch with the navy tradition. During the year there are held many painting anf sculpture exhibitions and also many traditional and modern musical festivals. The visitor can take part to many festivities that keep their traditional way, like the festival of the eight Saint Protectors of Hydra (24th June). Celebrations on New Year's Day begin with fireworks, peals of bells from the Churches and cannonading from the castle's canon at "Kavos" area. In the morning at the Church Metropolis there is a festive Doxology for the New Year in the presence of the Mayor and the authorities of the island, followed by a reception in the historic City Hall of Hydra island. At noon, Santa Claus comes to the island and welcomes his young friends by giving away gifts filled with love. At New Year's Eve the doors of the houses stay opened for the welcoming of the visitors. The house owner hangs a ribbon to the quest's neck and invites him for supper. With religious splendor Epiphany is celebrated each year with epicenter the Holy Virgin Cathedral of Hydra island. The day of the Epiphany, after the end of the sequence of the Great Sanctification was formed great procession with hymns and prayers, which was directed through the old neighborhoods of Hydra - Kiafas-Gkourmadas - until the Square Kalon Pigadionn, where the priests of the island had the blessing of the two wells. Near the noon, the procession reaches the northern breakwater of the harbor through the main street of Andrea Maiouli, so the Cross is tied with ribbon, fell to the sea from the hands of the bishop, to sanctify the waters. Despot chanting "En Jordan ..." and throws the cross into the sea, freeing from his hands three pigeons. The person who catches the Cross takes as a gift a blessing and a gold Cross. Sanctification in Hydra island, at the old days, took place on the eve of Epiphany, in order to expel the goblins. All housewives of Hydra, at the eve of Epiphany, went to the Church and after the end of the Liturgy, with pitcher transported the holy water on their homes, and then sanctified every corner of their home, as the cisterns and their wells. The rest of the holy water were stored in the icon for the rest of the year. The procession of the Epiphany as the modern days reaches the northern breakwater of the harbor through the main street of Andrea Maiouli, so the Cross is tied with ribbon, fell to the sea from the hands of the bishop, to sanctify the waters. Despot chanting "En Jordan ..." and throws the cross into the sea, freeing from his hands three pigeons. Also on Epiphany Eve all the priests of the parishes of Hydra hallow homes, shops and boats of parishioners. Then they all returned back at the Church to pray for a good year and for their health. The children, who fell to the sea to catch the Cross, they took it and went with it around the shops and were given gifts and sometimes money. The Litany was very great with many people gathering. All the people were there and the bells were ringing for the event. The consecration of the waters was also being done by the parishioners of the Church of St. John the Baptist in the harbor of Kamini Kamini since 1963. During the morning hours the submersion of the Holy Cross is being done and also the Blessing of the waters from the parish priest in the harbor of Kamini. Very famous in Hydra is the annual Carnival where tourists and local people can take part and enjoy. The festival is going around all the paths of the main city of Hydra and it ends at the port with fireworks, as entertainment continues all the night. The start of the Carnival in Hydra signaled in past years, the day of commemoration of St. Anthony the Great in the 17th of January. On this day, in all the neighborhoods of Hydra, the carnival people began to beat drums and drums, announcing the joyful message of Halloween. Today, the carnival are gathered in the square of Admiral Votsi and then climb the stairs of the road Anthony Lygnou. After the Mansion of Sahtouris, they turn right and arrive at Hillary's pit, where they make their first stop. There, they dance with island songs and with the accompaniment of treats. Then, via the route Anthony Kriezis leading Kamini and bypassing the route at the height of the Church of the Virgin, directed toward pit Tzathas or Bampori. Moving to position Petalidiza, near the Church of St. Barbara, turning west and heading for the port of Kamini. Passing the river end of Kaminion, they end at the Lakka of Kokoris, and make the second stop with treats and dances. After the second stop, the carnival is directed towards the Church of the Ascension and follow the road up the tower leading to Lakka Gavrili for the third and final stop of the procession of the carnival. Then the carnival from the pit Gavrili descends to the street of Anthony Lignou to reach again the square of Admiral Votsi and from there the carnival parade, with drums and Drums, goes to beach of Hydra, where the dance and songs are. Every year there are two established sailing races at the island, and attract an increasing number of vessels and visitors to the island who come either by vessels or by other means of transport. For all of us who love nature and want to test our strength, we organise each year a two-day competition in mountain trailing, with huge success, and which give us the opportunity to live here a unique experience. Hydra’sTrailEvent is being organised each year in the middle of April, with up to five different trailing and races, we also have races for the kids. From the total 5 races you will like the "Eros mountain trail", a route of 25,6 klm and the race downhill. In Hydra island its inhabitants keep the traditions and the religious customs of the Holy Week and Easter. Certainly the Easter holiday in Hydra is different from any other Easter you have lived in Greece. Visitors to the island throughout the Holy Week and Easter can experience the Holy atmosphere and participate in many different religious customs, throughought the island. From the middle of the Holy Week, which culminates in the Divine Drama, the locals and the visitors fill the churches, experiencing and participating with intense religious mood and subtlety in the Divine Drama. Thus the Holy Week flows in religious rhythms and ends in a brilliant Resurrection Night on the Holy Saturday night, to be completed with Judas' spectacular burning on the afternoon of Easter Sunday. On the evening of the Great Thursday in a climate of great devotion, takes place in the Holy Virgin Cathedral of Hydra island - as in the other parish churches of Hydra - the representation of the Crucifixion of Christ. On Good Friday, at the peak of the Divine Drama, the Lamentation of Christ was initially carried out in the parish churches of the island and then at the Holy Virgin Cathedral of Hydra island, with the participation of all the Holy Clergy of Hydra. All the bells of the parishes of Hydra were ringing in a sad rythm. First is being rung the Great Bell of the Monastery, followed by the bells of the other parishes of Agia Varvara, of Ypapanti and of Agios Dimitrios. During the Lamentation the sadness of the believers culminates. During the night of the Great Friday, at the port of Hydra island in front of the gate of the Holy Virgin Cathedral, the beautifully decoative Epitaphs from the parish Churches of Agios Dimitrios, of Agia Varvara and of Ipapanti are gathered. The mournful and solemn procession of the epitaphs ends at their perspective Churches. One of the most beautiful and most picturesque Hydra customs is the immersion of the Epitaph in the sea, on Good Friday evening, in Kamini beach. On this particular day the Epitaph, after its walking into the district, is being immersed into the waters by people who support it for the purpose of sunctifing the waters. With this custom they believe the sailor will return fro their journey safe. The custom was for the first time started in Kaminia during the year 1923 and since then the custom is repeated every year, according to tradition. The custom started by sponge divers of Kaminia whose sponge boats departed after the Sunday of the Holy Cross and returned close to the day of the Exaltation of the Holy Cross. The spectacle is magnificent, spectacular and every Good Friday followed by faith and reverently by all the parishioners and many foreigners come Kamini to watch especially this custom. The procession of the Epitaph at Kaminia is being done earlier than what of the rest of the Main place, to enable visitors to see all the customs. In the town of Hydra, after the pieta, the bells tolls. First does the big bell of the convent bells, followed by the remaining parishes of St. Barbara, the Visitation and St. Demetrius. All Epitaphs gather at the north entrance of the Holy Dormition Monastery, Square P. Kountouriotis followed the procession of Epitaphs through the cobbled streets of the town of Hydra. At the picturesque settlement of Vlychos in Hydra island and more specific at the Church of Saints Karpou and Papilou, the mournful and solemn procession of the epitaph is being done. Apart from the above Epitaphs, in Good Friday you can follow the procession of the epitaph of the Holy Monastery of Prophet Elias, located at the Prophet Elias Mountain, two hours from the settlement of Hydra. Also to the isolated location of Zouvra, where the Holy Monastery of Zouvra is, there is also a procession of the epitaph. A unique experience for those who want it. 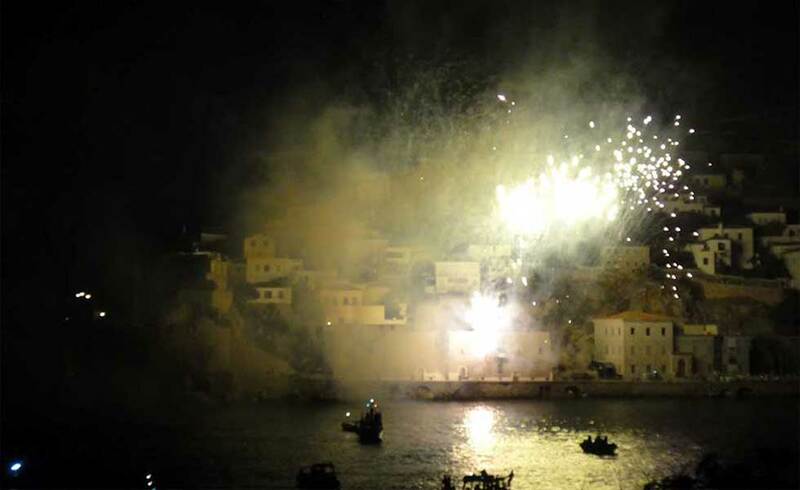 At recent years, the Holy Fire is comming to Hydra island the night of Holy Saturday. The Holy Fire is then given to all the Churches of Hydra and later, during the Holy Ceremony and the First Resurrection is being given to the people freely. The night of the Holy Saturday in a pious environment there is a Divine Liturgy at the Holy Virgin Cathedral of Hydra island. The same Liturgy is being done to all the other Churches of Hydra, with the bells tolling happily and giving the meaning of the Resurrection of Christ. The resurrection night the visitor can see many fireworks. The Sunday of Easter, before noon, there is a Divine Liturgy of Love, where the priests give one red Easter egg to all the people gathered. All parishes of Hydra had the custom of burning Judas, from old times, at the eve of Easter Sunday. The competition between parishes was great and indeed, during thr Holy Week, churches gouged tray to cover the expenses for the custom. The preparation for the construction of Judah began long before the start of the Holy Week. They made the large doll as a real man, with the correct size and dress him up with Jewish clothes. Inside the doll put straws. The doll's left hand made straight and into a fist, except from a finger from where they hung a purse with the 30 silver coins of the betrayal. From the 90's the burning of Judas is done at the port of Hydra island, in front of the Merchant Marine School. Miaouleia are the largest events of the island, dedicated to the Admiral Andreas Miaoulis, held each year approximately at the last week of June, to mark the 177 years after the death of Admiral Andreas Miaoulis. The celebration lasts one week. The event includes, in the day before the last, celebrations, the welcomming of the representatives of the Goverment, the Navy and the officials at City Hall by the Mayor and the City Council. The last day, there is a Holy Mass at the Cathedral and a transfer from the Archive - Museum of the vessel with the heart of Admiral Andreas Miaoulis. Then a memorial service at the statue of Admiral Andreas Miaoulis. In "Miaouleia" unless part of the ritual, including exhibitions, lectures, musical events, theatrical performances, games, folk dances, torch, boating and sports games. Followed by a crowd, honoring thus this feast of remembrance events and people that played a major role in the outcome of the revolution of 1821. The festivities end with the burning of fireworks, and the enactment of the Battle of Gerontas and the burning of the Ottoman flagship, the final day of events. KOUNTOURIOTEIA are celebrations, organized by the Municipality of Hydra, commemorating the 76 years since the death of the First President of the Greek Republic, Hydra Admiral Paul Kountourioti. During the festivities, arount at the end of August, there are a lot of tourists and locals who attend, also invited officials, representatives of political and military authorities as well as representatives of literature and art. The Kountourioteia include a lavish six-day celebration program, which is filled with tours of the island's museums, exhibitions, screenings, lectures, book presentations and sporting events. On the last day of the events there is a memorial service and wreath laying at the statue and the Tomb of the Admiral and the first President of the Greek Republic, Paul Kountourioti. In 14 of November is held a festival to commemorate the martyr Saint Konstantinos of Hydra, whom his Church was built to the place that his house used to be, in "Kiafa". Christmas is celebrated with special honor in all the parish churches of Hydra island. At the Cathedral of the Assumption of the Virgin, the Archbishop of Hydra - Spetses - Aegina, is doing the Christmas Divine Liturgy.